SOUTHERN BELLE WANTED A CABIN "ON" THE LAKE INSTEAD OF A CABIN "AT" THE LAKE. 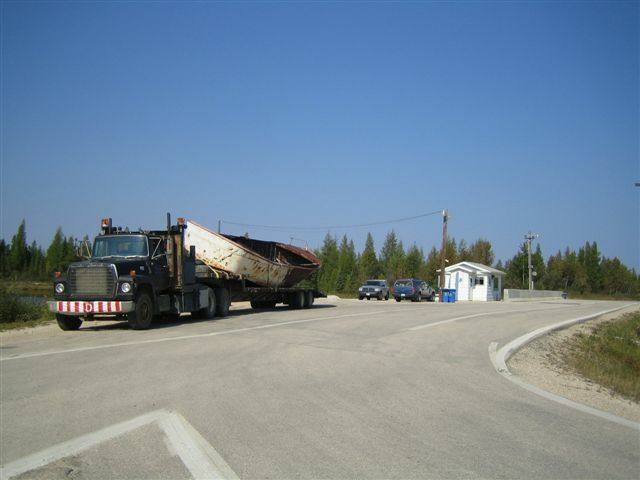 SO WE CHASED DOWN A BIG 40 FOOT BOAT IN THE PAS MANITOBA WITH SOME HELP FROM OUR FRIENDS IN COMPUTER LAND. 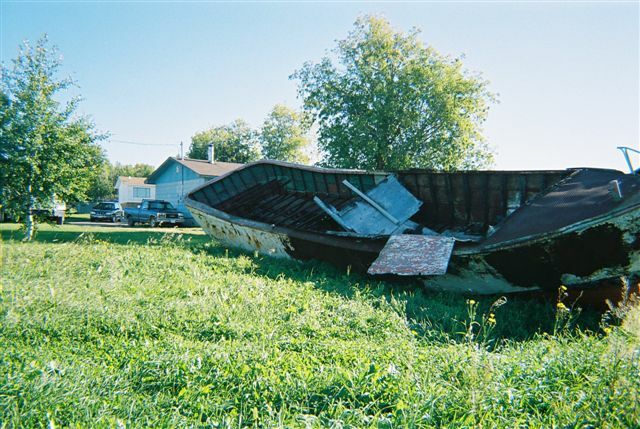 THE PICTURE THAT I LIKED THE MOST THAT WAS EMAILED TO ME TO SEE THE BOAT WAS THE ONE OF IT IN A BACK YARD OF HOME. EASY TO LOAD WAS THE THOUGHT THAT CAME IN TO MY MIND COMPARED TO DRAGING T OUT OF A LAKE. 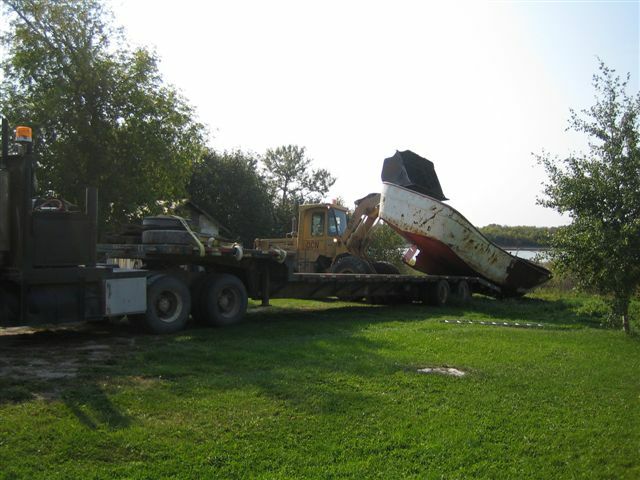 WITH A LITTLE HELP FROM A BIG 950 CATERPILLAR LOADER THE BOAT WAS LOADED IN NO TIME. THE SCALE BOYS EVEN CHECKED OUT THE BOAT FOR 2.5 HOURS AND THEY EVEN THOUGHT IT WAS A NICE BOAT. 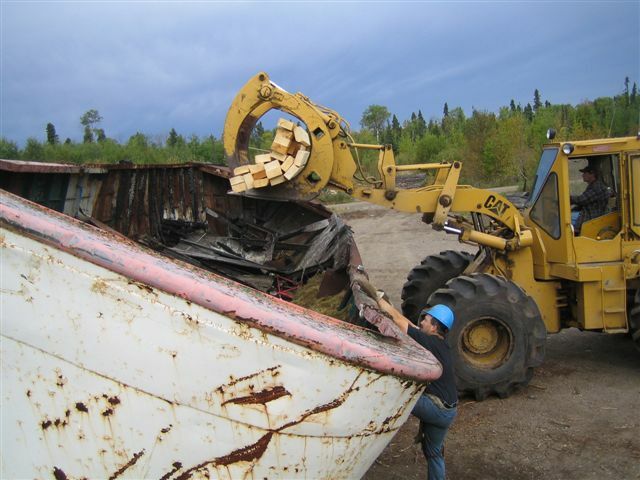 THE BOAT WAS EVEN VERY HANDY TO LOAD LUMBER IN FOR THE RETURN TRIP TO THE "KINGDOM". 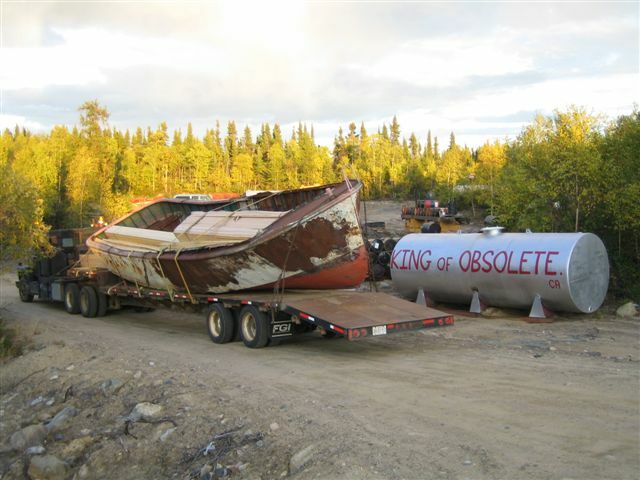 ONLY THE "KING OF OBSOLETE" WOULD HAVE A LOAD LIKE THIS. 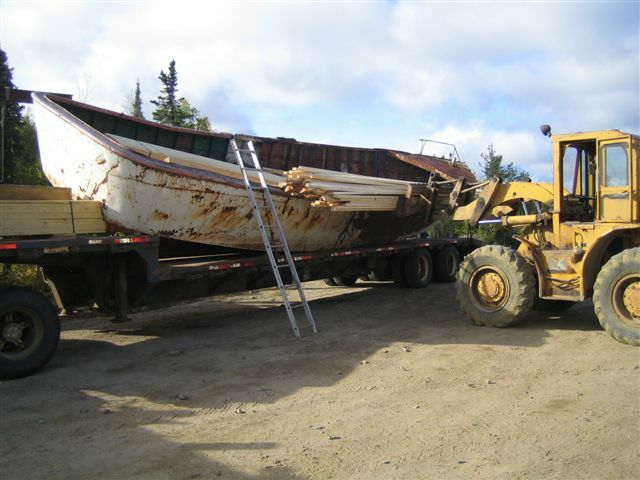 PLUS IT ONLY TOOK A DAY TO OFF LOAD THE LUMBER OUT OF THE BOAT. I TOOK MY TIME SO I DIDN'T DAMAGE THE LUMBER. 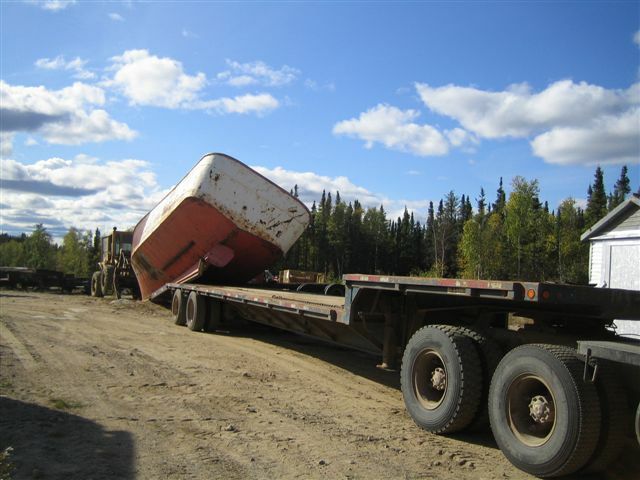 NEXT WE SLIDE THE BOAT OFF OF BUDDY BARRY'S BEAVER TAILED TRAILER. 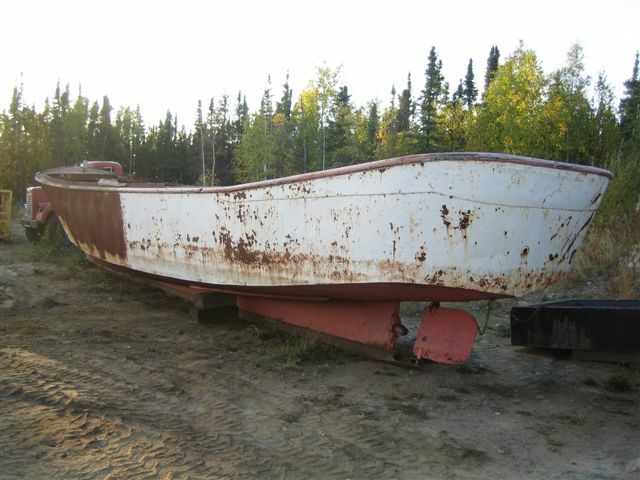 THIS IS WHERE WE NAMED THE BOAT THE "NORTHEN BELLE" BECAUSE IT FITS IN WITH ALL THE OTHER COLLECTABLES IN THE "KINGDOM". 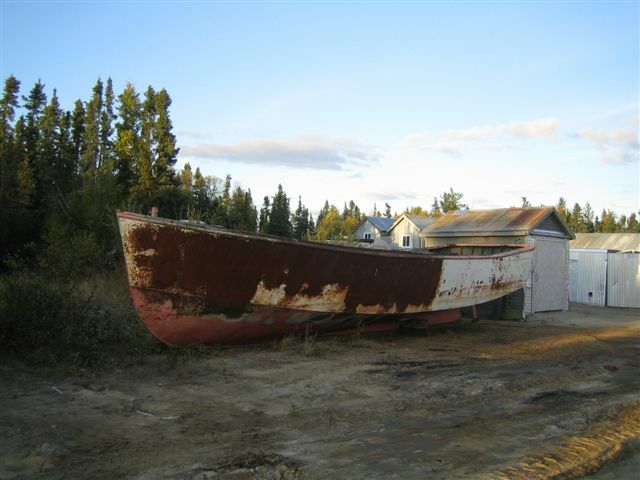 NOW ALL WE HAVE TO DO IT FIX THE BOAT WITH THE BASEMENT UP AND BE READY TO ENJOY THE LONG SUMMER NIGHT IN THE GREAT WHITE NORTH.